We all know that you only get what you pay for but sometimes your budget demands a compromise. And with most brands compromise often means having to put up with poor design, poor build quality and poor performance. 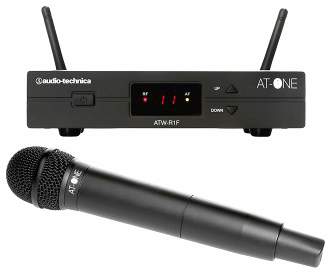 Audio-Technica's entry-level AT-One Series is the exception, and the model ATW-13F is their handheld system from that range. With a 2 x 4 channel frequency plan for enhanced flexibility, sturdy but stylish build quality and a simple user interface, AT-One is ready to become your perfect wireless companion. It is designed with simplicity and ease-of-use in mind. Equipped with a practical carrying case, rack-mount kit and detachable antennae, AT-One is the perfect balance of price and performance, ideal for those looking for accurate, reliable performance at an entry level price. The ATW-13F handheld system features the ATW-T3F cardioid condenser handheld transmitter, with 10mW RF output and 10 hour battery life. However, this is just one of two configurations we offer in their AT-One Series. We also offer their ATW-11/PF beltpack transmitter system with it own lavalier microphone. You will find it via this menu. We would recommend this AT-One system for light-to-medium duty occasional use.